Where Are We Now, Three Years After the Onset of the Crisis? 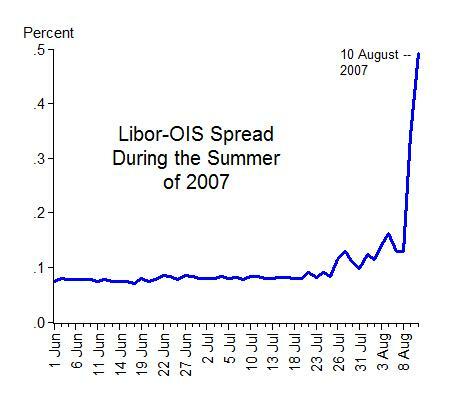 The chart below shows how things looked back then; it’s like a “money market EKG,” called LOIS3 (the spread between three-month LIBOR and OIS, the market’s expectation of the federal funds rate over the same three months). The last reading is on Friday, August 10, 2007 and is what you would have seen if you looked at your computer screen on Sunday August 12 and tried to figure out what would happen next. Yes, there’s obvious evidence of chest pains, perhaps even worse. But “what’s causing them” was the question everyone was asking. “What’s the diagnosis?” I have argued that the problem was misdiagnosed, and thereby mistreated, by policy makers, and that is why the patient eventually went into “cardiac arrest” a year or so later, though some still say that the treatment was correct and things would have been even worse without the treatment. If you want to see what the “money market EKG” looked like at the time of “cardiac arrest,” take a look at this nice interactive chart on Bloomberg. Unfortunately the answer to Howard Green’s question above is that we are still in a pretty dire situation. We are now going into the fourth year of “crisis-recession-fizzled recovery” and for several reasons the outlook is bleak unless policy is changed as I had the chance to explain in the TV interview, divided into segments One, Two, and Three.